Tottenham's U18 team are the first players to grace the new stadium as Sky Sports News witnesses its grand opening with some very emotional fans. Mauricio Pochettino said he felt like crying after watching Tottenham's new stadium finally host its first football match. The 62,000-seat arena, which was due to open last summer, held its first official test event ahead of a proposed April 3 opening date when the club's Under-18s side took on Southampton on Sunday, with Spurs' youngsters winning 3-1. J'Neil Bennett made history when he became the first scorer at the Tottenham Hotspur Stadium, setting his side on the way to victory in the 11th minute with a lovely curling effort from the left. Harvey White and Dilan Markanday also notched for Spurs while Kornelius Hansen became the first opposition player to score when he bagged for Saints. The opening of Tottenham Hotspur Stadium, built on the site of the club's White Hart Lane ground, had been repeatedly put back because of construction and safety delays. But 679 days after the final game at the old stadium, the new ground has hosted its first game and Pochettino could not be happier. "We all feel the same, so excited. I got the same feeling when we left White Hart Lane on the last day, we were crying and now in the first day in the new stadium we feel the same emotion," Pochettino said, on the pitch at half-time. It was the first of two test events required to take place in order to receive the relevant safety certificates from Haringey Council, with the second coming next Saturday when a Legends team take on Inter Milan, when the capacity will be raised from 30,000 to 45,000. 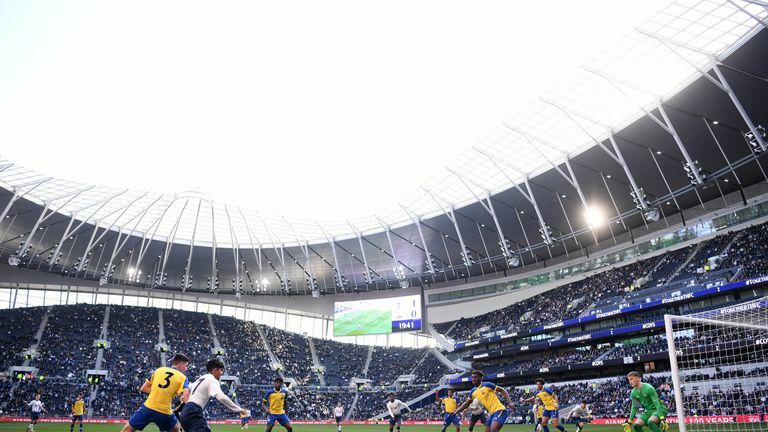 Sky Sports News reporter Jeremy Langdon was in attendance to witness the big unveiling and offered his thoughts on Tottenham's new home. "The friendliness and the new Spurs fan ambassadors stood out as they helped supporters get in," Langdon said. "There are very visible bag searches and lots of security. The onus is on having small and clear bags to speed access. "Forget bringing anything big and think hard about driving too. The road closure zone around the new stadium makes coming by car even trickier than it was before. Some advice: leave your car and leave your notes. This is a cashless stadium. "Inside, the stadium itself is incredible and now the second biggest Premier League venue. "The sweeping curves are spectacular and pleasing on the eye. And the high and tight steep stands are surely what a proper football stadium should be. There are echoes of the old White Hart Lane here."